The Massachusetts State College Building Authority is a public instrumentality of the Commonwealth charged with financing, designing, constructing, and overseeing the management of revenue-funded facilities - housing, dining, athletic, parking, and other student activity facilities - for the nine state universities. Recent amendments to the enabling legislation expand the mission of the Authority to include the fifteen community colleges. Another recent change to the legislation enables the Authority to finance certain academic facility projects located at the state universities and community colleges. The Authority receives no appropriation from the Commonwealth; all revenues to support facility design, construction, and operation are derived from the rents and fees paid by students for the use of these facilities and services. 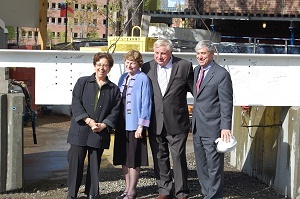 From Left to Right: Former MSCBA Board Member, Carol Gladstone; Former MassArt President, Kay Sloan; MSCBA Board Chairman, James T. Morris; MSCBA Executive Director, Edward H. Adelman.